Many multi-object-tracking (MOT) techniques have been developed over the past years. The most successful ones are based on the classical tracking-by-detection approach. The different methods rely on different kinds of data association, use motion and appearance models, or add optimization terms for occlusion and exclusion. Still, errors occur for all those methods and a consistent evaluation has just started. In this paper we analyze three current state-of-the-art MOT trackers and show that there is still room for improvement. 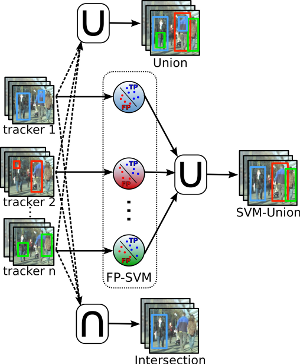 To that end, we train a classifier on the trackers' output bounding boxes in order to prune false positives. Furthermore, the different approaches have different strengths resulting in a reduced false negative rate when combined. We perform an extensive evaluation over ten common evaluation sequences and consistently show improved performances by exploiting the strengths and reducing the weaknesses of current methods.